Before we continue on the way to deployment, it is important to add a stage in our pipeline to improve the code quality of our application. In this tutorial we are introducing SonarQube, a tool that can help us to find bugs before they arrive in production, and help us to manage the technical debt. If needed, select Advanced Purchase (also named Custom). Finish the instance creation by clicking Create Instance. Go back to the ECS console, select Instances from the left-side navigation pane, and choose your region on top the screen. You can see your new instance. Click EIP from the left-side navigation pane. On the new page, click Create EIP. Click Buy Now, select the agreement of service, and click Activate. Go back to the EIP console and check your new EIP. Next to you new EIP, click Bind. Click OK to bind the EIP to you ECS instance. Copy the IP Address of your EIP (it should be something like 47.74.253.23). Log on to the Domain console. On the row corresponding to your domain (for example, my-sample-domain.xyz), click Resolve. Click OK to add the record. Log on to the ApsaraDB for RDS console. Go back to the ApsaraDB for RDS console and wait for the RDS instance to start (it can take few minutes). Set a name for your RDS instance by moving your mouse cursor over it and by clicking the pen icon. Set the name devops-simple-app-sonar-rds and confirm. Click Set Whitelist in the Basic Information > Intranet Address section. Click Add a Whitelist Group. Click Upload ECS Intranet IP Address. In the Whitelist field, move your mouse cursor on top of the first IP address. A bubble appears. Move your mouse cursor on top of the Instance Name bubble field. If the instance name is devops-simple-app-sonar, select this IP address. If not, repeat on the next IP address. After you have selected exactly one IP address, set the group name devops_simple_app_sonar_wlg. Note The whitelist is a security feature: only the ECS instances in this list can access the database. Click Accounts from the left-side navigation pane. Click OK to create the account. Click Connection Options from the left-side navigation pane, and save the Intranet Address in the Connection Information section (it should be something like rm-gs5wm687b2e3uc770.pgsql.singapore.rds.aliyuncs.com). Refresh your web browser tab with SonarQube and check the URL: the protocol HTTPS must replace HTTP. Open your web browser tab with SonarQube (URL like https://sonar.my-sample-domain.xyz/). Click Log in on the top-right of the page. Click your avatar on the top-right of the page and select My Account. Click Change password, and the message The password has been changed! is displayed. Click Administration from the top. Click Security in the top-sub-menu and select Users. Click Configuration from the top-sub-menu and select General Settings. Click Security from the left-side navigation pane. Enable the switch in the Force user authentication property and confirm by clicking Save. Click Quality Gates from the top. Click SonarQube way on the left panel. Click Copy on the top-right of the page. Set the name Stricter SonarQube way and click Copy. Do not forget to click Add next to the conditions you just added. Click Set as Default on the top-right of the page. 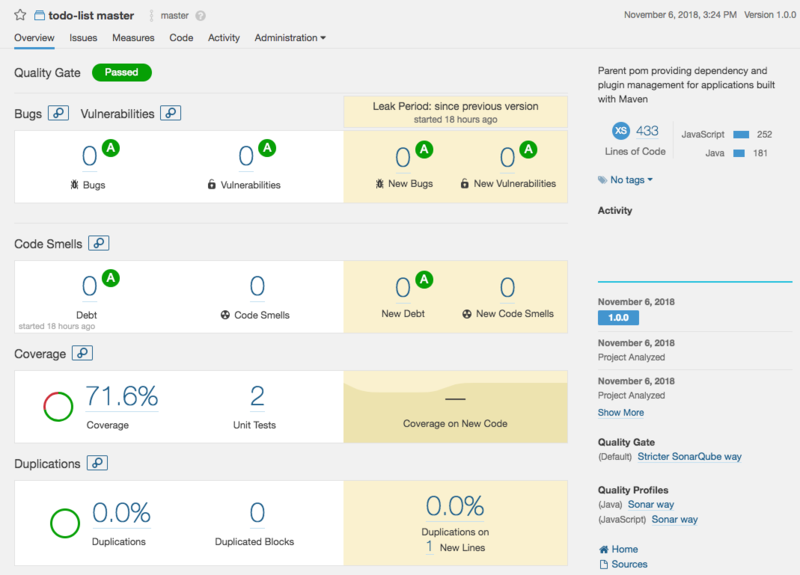 SonarQube is now ready! Let’s integrate it with our CI pipeline. If you are still logged in as admin, log out by clicking your avatar on the top-right of the page and select Log out. Login with your username and password (do not use the admin user). Click your avatar on the top-right of the screen and select My Account. Click Security from the top-sub-menu. Next to Generate New Token, set the name todolist and click Generate. You should see a new token appearing (something like cfe2e3d7d7a15df20e3ecb7de53b6a23b3757474). Note The following part of this section will modify two files: pom.xml and .gitlab-ci.yml. You can see the results by browsing in the sample-app/version2 folder. JaCoCo, used to analyze the code coverage of our unit tests. SonarQube, used to communicate with our SonarQube server. target/site/jacoco - A report containing coverage results in multiple formats (HTML, XML and CSV). You can check it by running mvn clean install from your project directory and by opening target/site/jacoco/index.html in your web browser. target/jacoco.exec - Data used to generate the HTML, XML and CSV reports. sonar.host.url must be set to your SonarQube server URL. sonar.login must contain the token that SonarQube generated for you. sonar.branch must contain the Git branch name. Please note that this feature is working but deprecated in SonarQube version 6.x (and removed in the version 7.x). It is now replaced by sonar.branch.name and sonar.branch.target. However, this functionality is not free anymore. You can read the official documentation if you are interested in purchasing the Developer Edition. A cheaper alternative for the versions 7.x is to set the sonar.projectKey property with a name that contains the branch name. maven.test.failure.ignore must be set to true to run the SonarQube analysis even when some tests fail. - "mvn clean install sonar:sonar -Dsonar.host.url=$SONAR_URL -Dsonar.login=$SONAR_LOGIN -Dsonar.branch=$CI_COMMIT_REF_NAME -Dmaven.test.failure.ignore=true -Duser.home=." - "java -jar sonar-gate-breaker-all-1.0.1.jar -u $SONAR_LOGIN"
A new stage quality has been added under the stages block. The build block has been simplified: the unit test execution has been disabled thanks to the -DskipTests=true parameter, and the artifacts block has been removed. The new quality block contains 3 commands: the first one runs the unit tests and launch the SonarQube analysis, and the second and third ones wait for the analysis to complete and break the pipeline if there is a problem (for example, a unit test failed or the quality gate is not respected). SONAR_URL will contain the URL to your SonarQube server. SONAR_LOGIN will contain the generated SonarQube token. Open GitLab (the URL must be like https://gitlab.my-sample-domain.xyz/). Click Projects in the top menu and select Your projects. In the left-side navigation pane, select Settings > CI/CD. git commit -m "Add a quality stage in the pipeline." As you can see, there is now two stages in the pipeline. You can click them to check detailed logs. Explore this interface by yourself, for example click on the coverage percentage: you will get a list of Java files with their coverage percentage. If you click one of these files you can see which line is covered and which one is not. Note Code coverage is a good indicator before you attempt to execute a major code refactoring: like a safety net, a good code coverage means that you have a greater chance that your unit tests will catch bugs before they hit production. git commit -m "Break a unit test on purpose." git commit -m "Fix the unit test." Your GitLab pipeline and SonarQube project should be successful. git commit -m "Add a potential data race issue." This time the problem comes from a bug inside the code. Note Thread-safety issues are usually quite hard to fix because the bugs are not easy to reproduce. git commit -m "Fix the potential data race issue." 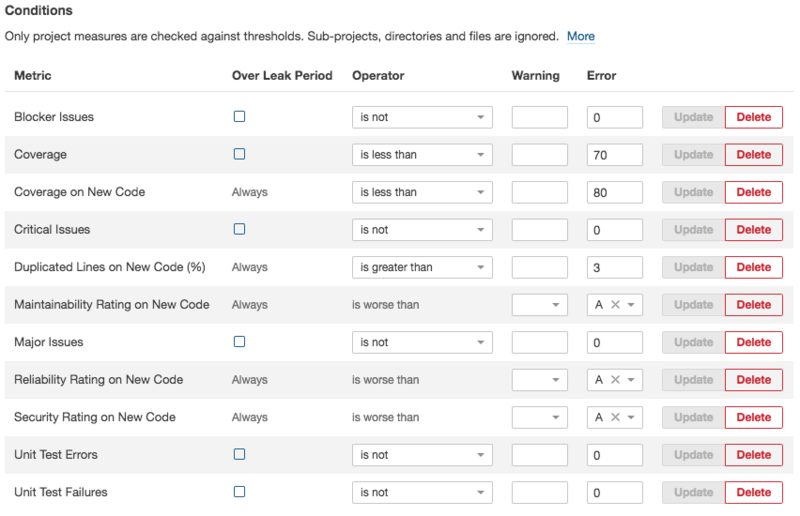 The GitLab pipeline and SonarQube project should be green again.